Here are 14 Informal Letter writing topics for Class 6 and 7. These are Informal Letter Writing Examples for Class 6 and class 7. Kids can see the pattern of these letters and use their own wording as per requirement. Informal letters are personal letters and Formal letters are official letters. These are very simple letters for Class 9 students of Pakistan and also easy informal letters for class 8. However, standard Informal Letter Examples for Class 8 are also available here. Here you will get number wise 14 topics for informal letter writing practice for the students of Class 6, Class 7, Class 8 and Class 9. Informal Letter Example No.01 | Write a Letter to Your mother who is worried about your health. Aslam o Alaikum! I received your kind letter yesterday. Excuse me for not writing you soon. I was ill. Please pay my respect to elders and love to youngers. For Class 9 you can get an outstanding letter on the same topic here. Aslam-o-Alaikum! I received your kind letter yesterday. Excuse me for not writing you soon. Mother was ill. How is she now? Inform me about her health. Respect to elders and love to youngers. 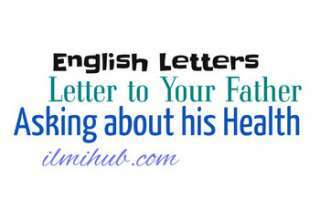 A long and outstanding letter to your father asking him about the health of your mother is available here. Informal Letter Example No.03 | Write a Letter to Sister Congratulating her on success in the examination. Aslam-o-Alaikum! I received your kind letter yesterday. Excuse me for not writing you soon. You have passed the examination. You got good marks. I congratulate you on your success. Please pay my respect to elders and love to younger. On this topic, you can get a better and long letter for higher grads by going here. Informal Letter Example No.04 | Write a Letter to Your mother about the test you have just taken. Aslam-o-Alaikum! I received your kind letter yesterday. Excuse me for not writing you soon. I was preparing for test in English. It was held yesterday. I did well. I shall get good marks. For higher classes, this Letter is available at this link. Informal Letter Example No.05 | A letter to father requesting him to send you some extra funds for payment of hostel dues. Aslam-o-Alaikum! I received your kind letter yesterday. Excuse me for not writing you soon. I am in need of money. I have to pay my hostel dues. I have to also buy new books. Kindly sent me 500 rupees. Please pay my respect to elders and love to younger. You may also like Outstanding Letter to father asking him for extra funds to pay hostel dues for Class 09. Aslam-o-Alaikum! I received your kind letter yesterday. Excuse me for not writing you soon. I congratulate you on your birthday. I have sent you a gift. You will be happy to get it. Please pay my respect to elders and love to younger. 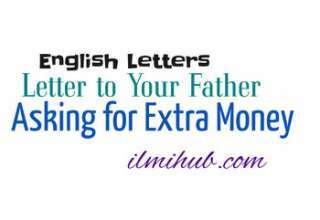 To get an outstanding Letter to this Informal letter writing topic Go Here. Aslam-o-Alaikum! I received your kind letter yesterday. Excuse me for not writing you soon. I am going to Muree. I invite you to spend some holidays with me. We shall work and play together. We shall enjoy a lot. Please pay my respect to elders and love to youngers. Students of 8th Class and 9th Class can check this letter on this link. Aslam-o-Alaikum! I received your kind letter yesterday. Excuse me for not writing you soon. I congratulate you on the marriage of your sister. I wish her good luck. Please pay my respect to elders and love to youngers. Students of Class 8 and 9 should check this Letter on this Page. Informal Letter Pattern No.09 | Write a letter to a friend requesting him to lend some books. Aslam-o-Alaikum! I received your kind letter yesterday. Excuse me for not writing you soon. I have no English and Math book. I am in need of them. Lend them to me for some days. This letter is available in a long format as well. Informal Letter Pattern No.10 | A letter to a friend thanking for his hospitality during your visit to his house. Aslam-o-Alaikum! I received your kind letter yesterday. Excuse me for not writing you soon. I enjoyed your company last week while staying at your house. You and your family showed a lot of love and care. I thank you for your hospitality. For the higher school grade students, one more example is here. Informal Letter Writing Topic No.11 | Write a letter to Your friend for the condoling death of his mother. Aslam o Alaikum! I am shocked to know the sad news of your mother’s death. She was a noble lady. She was kind to us all. It is a great loss for your family. I advise you to face the misfortune with courage. May her soul rest in peace. You may also check this if you are a senior student. 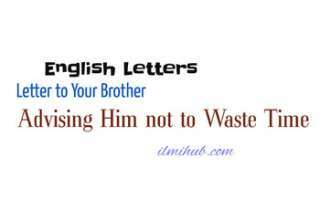 Informal Letter Writing Topic No.12 | Write a letter to Your brother advising him to take steps to improve his health. Aslam-o-Alaikum! I received your kind letter yesterday. Excuse me for not writing you soon. Your health is not good. I advise you to take exercise daily. Hope it will improve your health soon. One more letter to brother about Health for Senior students can be reached by clicking here. Informal Letter Writing Topic No.13 | Write a letter to your Sister thanking her for a Watch Gift. Aslam-o-Alaikum! I received your kind letter yesterday. Excuse me for not writing you soon. I got your gift of a wrist-watch. It is fine. I thank you for that. For senior students, this letter is placed here. Informal Letter Writing Topic No.14 | Write a letter to your friend thanking him for the books he lent to you. Aslam-o-Alaikum! I received your kind letter yesterday. Excuse me for not writing you soon. I got your books. I thank you for that. I will use them with care and return them soon. One more Informal Letter Writing Example on this topic for the students of Class 8 and Class 9 is available here. I am sure that these informal letter writing topics for Class 6 and Class 7 will be useful for the students to learn about this. I have also placed the links of Informal letters for class 8 under each letter. You can tell us about the quality of this content in the comment box below.